I am so uninterested in shopping with friends that I cannot hide my indifference. A lone shopper, I saunter through the passages of ladies' fashion inattentive to the new styles emerging in place of past fads; I buy what sits comfortably on my hips, pieces I would take pleasure in feeling against the first layer of my skin. Immediately after, I rush out and do not return for months. Seeking refuge in a nearby supermarket, open market or roadside stand, peace is found. Sweet red torpedo onions promising milky white juice, plump tart lemons in want of a squeeze, freckled strawberries packed to knit a tight pattern of royal red — I could spend hours here. Regularly I am given a sharp look; a glare uncomprehending of the causes which would explain why I would spend more on food purchases, my motive for paying three extra pounds for a more yellow bunch of unspotted bananas. Some women lust after shoes, I spend on pretty food. Justifying it I'll say, “This what I do, my job,” to soften the blow of buying good quality saffron, wiry and unaltered with added oils. I deliver recipes and colorful food photos to people online and in print, to motivate them to cook at home; it's as simple as that. Photogenic foods are what make my blog work, they are what make my words weigh more than their real value; they are that promise of making something that brightens up the kitchens of both my home and yours. Now that I've chosen this uneven path as a career choice, I struggle with the words “food blogger.” After moving to Kuala Lumpur and taking a break of a year (and a half) of unerringly doing nothing, I started writing about food and taking photos in my living room. Two years onward, I am made uncomfortable by the reluctant smiles sympathetically sent my way when asked what it is I do. Kathy Patalsky of “Healthy Happy Life,” an inspiring vegan and fellow “food blogger” (if we must call it that), has pushed me, along with many others, to start finding an alternative title for what we do. As recipe developers, part-time photographers, food writers and researchers, what can we be called? “I'm an Internet Content Producer in the Culinary sector — specializing in vegan recipe development and food photography. I also produce freelance work in the print and mobile sectors,” declares Kathy. And I'm listening to her. If I too manage to make something substantial out of my blog then why not? To some, it might seem a little unrealistic to call ourselves something other than what we initially started out as but throughout the last few years, bloggers of all kinds have moved on to becoming political analysts, journalists, television reporters, cooking show hosts and caterers. We just can't seem to find a better word for those who cook, write and photograph their work all at the same time. Food bloggers usually grow to become full-time writers, professional food photographers or hired recipe developers. When will all three merge away from the internet? Hello, I'm Sarah and I'm an internet content producer in the culinary sector. I specialize in Middle Eastern food culture, recipe development and food photography. I also produce freelance work as a food columnist in the print sector. Does that sound better? More like a cooking show? Let's continue. Today, I want to share with you a recipe inspired by the way we Egyptians fry fish, sealed in a garlicky cumin crust, made crunchier with the cornstarch I learned to use in Malaysia and lifted with the heat of ginger and mustard, my flavors of India. Staying taut when you pick up a slice, it stays flat like an over-sized potato chip, able with its outer strength and soft center to hold dips, spreads and finely-chopped salads. This recipe simplifies what I'm about — an Egyptian-Indian tired of monotonous food, scouring the market to find a firm aubergine, widely eaten in Egypt and India, that will pose for a picture with grace and end with an adventure in your mouth and mind. Measure out the mayonnaise and place it in a small bowl. Add the garlic and ginger powder then the yellow and whole-grain mustard and stir until completely incorporated. If you're making this ahead of time, refrigerate. In a separate bowl, whisk together the flour, cornstarch, salt, garlic, cumin and chili powders. Set aside. Dip each aubergine slice into the beaten egg then dust with your flour mixture. Gently tap off any excess flour to avoid clumping and place each prepared slice on a clean baking sheet lined with parchment paper. In a large pan, heat 2 tablespoons of olive oil at a time over medium-high heat. 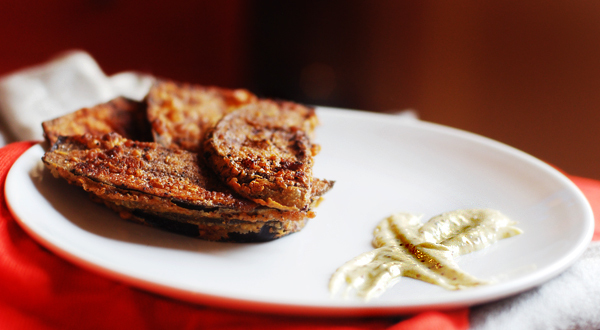 Dip a few aubergine slices at a time until golden brown on both sides. This should take around 2-3 minutes on each side. Continue to add two tablespoons of olive oil to the pan before adding each batch. Prepare the rest of the aubergine in the same fashion and place on a clean plate. Serve with the ginger-mustard mayonnaise. If you ever do decide to drop by Egypt, let me know beforehand. I'd love to show you around. I love anything aubergines..love the ginger mustard mayo condiment!